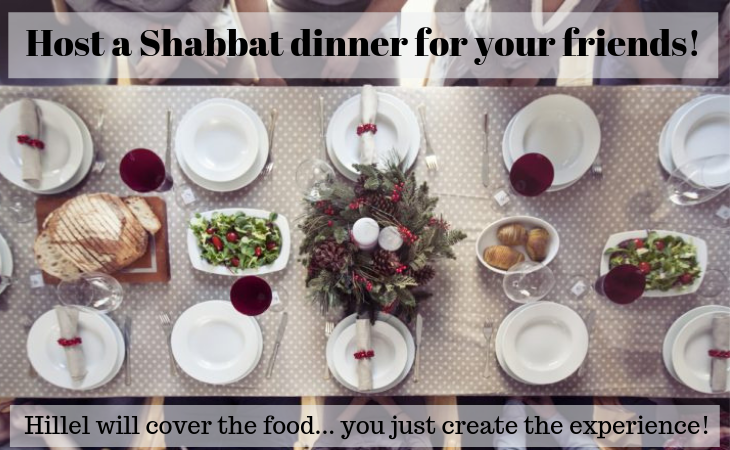 Invite friends over and host your very own Shabbat Dinner! Take part in Shabbat Across Campus on February 22nd by hosting a meal for your friends, for strangers, or for a combination of both! Note that information for guests is below. If you are interested in hosting, please read all the following info carefully. The sign-up form is at the bottom. (1) Picking up Shabbat food from Hillel. Hillel will order the food ahead of time and contact you about when to pick it up, plus give you instructions for heating it up at home. This will include a chicken dish, a vegetable dish, and a starch. If you want to augment your meal by making/buying soup, salad, dessert, or something else, you are welcome to do so! Hillel will not reimburse those costs, but we encourage you want to do whatever to make your meal special. (1) Host a closed Shabbat dinner. This means you will fill your own Shabbat dinner table with guests, and would rather not have other guests placed at your dinner. Interested, but not sure you’re comfortable hosting? Don’t worry, we will help make this as easy and fun as possible for you! Apply anyway, and the Hillel staff will reach out to help you figure out what exactly you want to do and help you make it happen. All guests will need to fill out this form by noon on February 20th to let us know whose meal you are attending and inform us of any dietary restrictions. Hosts, you are welcome to fill out that form for your guests if that will simplify the process for you – just make sure you have the right info! The final day to register to host and get food from Hillel is FRIDAY, FEBRUARY 15th. If you haven’t registered by then, we will not be able to provide you food. The final day to register to host and prepare/order your own meal is MONDAY, FEBRUARY 18th. If you register later than this, Hillel cannot reimburse your costs. ALL GUESTS must be registered by noon on February 20th. If you aren’t registered by then, we cannot guarantee that we will be able to accommodate you. Sorry! Click here to sign up to host!